What is the purpose of the Open Space method? When a group of people must tackle a common complex challenge you can release their inherent creativity and leadership as well as their capacity to self-organize. With the Open Space method all issues that are most important to the participants are raised, included in the agenda and addressed. With the co-created agenda people will take responsibility very quickly for solving problems and moving into action. Letting go of central control (i.e. the agenda and assignments) and putting it in the hands of everyone generates commitment, action and innovation. Duration: Sessions can take from 60 minutes up to several days. Amount of people: You can use Open Space for groups as large as a couple of thousand people! Invite people to come and address a common complex problem. Encourage them to co-construct the agenda with topics they are passionate about. Ask any participant to join the sessions they care about. 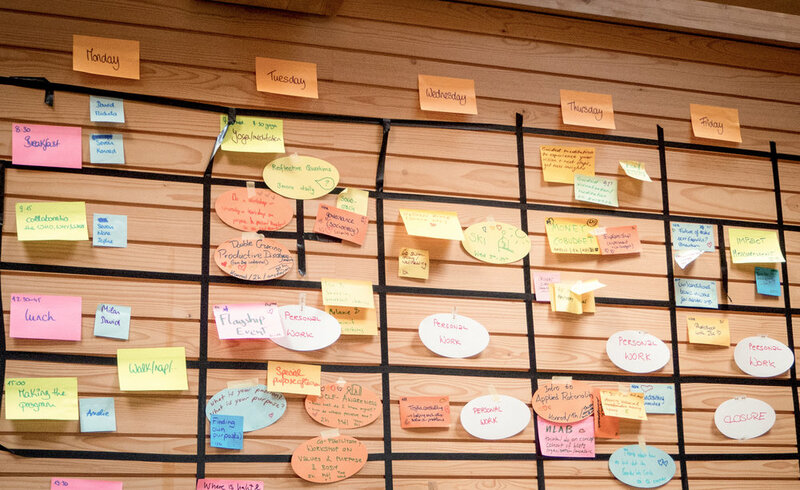 You need a large blank agenda (flip chart, paper or whiteboard) that can contain slots for enough concurrent sessions to accommodate what is likely to emerge, given the challenge and the number of participants (one rule of thumb is that 3 out of 10 participants will post a session, e.g. there will be 15 sessions posted from 50 participants.). For groups larger than 40 you need microphones. Start together in one large circle (or as many concentric circles as needed) and continue with groups of various sizes, self-organized around the agenda topics. Frist, a facilitator introduces the method of Open Space including the Law of Two Feet and its Four Principles. Second, during the “Marketplace” participants propose topics plus a time and place for the groups to meet. Third, the conveners facilitate sessions and the groups develop recommendations and action plans. Notes are taken and published or posted. Finally, the Open Space is concluded with a debriefing, the distribution of proceedings and a proper closing. Newer Postcollaboratio helvetica at SDSN launch Switzerland!